Robbie Adrian organic blankets combine green with glam and are a favorite among celebrities including Jessica Alba, Nicole Richie, Katie Holmes and Christina Aguilera. The blankets are available in the company’s very popular nursery sizes and the company just recently announced the availability of its organic adult throw. Together, the adult throw and the nursery blanket, make a great Mommy and me gift for the holidays! The blankets make wonderfully, thoughtful gifts that are destined to become cherished family heirlooms. Robbie Adrian, designers of luxury organic blankets, offers gift givers stylish, earth-friendly options this holiday season. By choosing the simple, classic elegance of a Robbie Adrian blanket, holiday shoppers are truly demonstrating both their love for someone special and their love for the environment. Robbie Adrian blankets provide a sophisticated style that is perfect in both traditional and modern nursery settings. 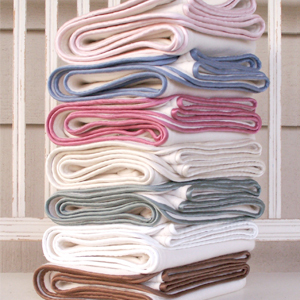 The company’s entire product line is made in the U.S., with 100% certified organic, USA grown cotton and natural silk. The desire to have healthier, more eco-friendly fibers wrapped around their baby, has buyers including many celebrities, lining up for stylish Robbie Adrian organic blankets. Jessica Alba, Jennifer Lopez, Christina Aguilera, Katie Holmes, and Nicole Richie all wanted the fresh, clean style-driven look of Robbie Adrian luxury organic blankets for their children. Blankets purchased through the Robbie Adrian web site will arrive wrapped in sustainable materials. – The wrapping tissue is handmade with kozo; which falls naturally from mulberry trees. – The shipping box is made out of 55% recycled fiber content. – The receipts are printed on seeded lotka paper. Each receipt can be planted directly into the soil to produce a bloom of red and white Coreopsis and Sweet Alyssum flowers. – The box and blanket are both tied with 100% natural silk ribbon. – The gift boxes are hand crafted beautifully of natural materials and can be used over and over again! According to the Sustainable Cotton Project, organic cotton is cotton grown without harmful pesticides or chemical additives to fertilizer, relying instead on methods with less ecological impact. This contrasts with conventionally grown cotton, where up to 1/3 of a pound of chemicals is used to produce one cotton T-shirt. If the rich colors and silk ruffles don’t sway you to buy organic, consider that seven of the top 15 pesticides used on cotton crops are either listed as “probable” or “known” carcinogens by the Environmental Protection Agency. Robbie Adrian luxury organic blankets range in price from $44 to $132 and are available for purchase online at http://www.robbieadrian.com. 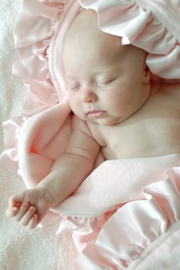 Founded in 2007, Robbie Adrian prides itself on being the premier manufacturer of luxury organic baby blankets. Robbie Adrian blankets are made in the US, with 100% certified organic, USA grown cotton fleece and velour and trimmed with natural silk. The company’s goal is to bring color, fashion and style to organic baby products. Their passion is providing customers with the highest quality blankets and superior customer service. More information on Robbie Adrian can be found at http://www.robbieadrian.com.